On the day of his greatest triumph, an artist is devastated by the suicide of his fiancée. He is compelled to unravel the mystery and to discover who his fiancée really was. Work of Art follows the sleuthing of recent Turner Prize winner Jason as he tries to make sense of his fiancée and fellow artist Catherine after she commits suicide with her lover. The book starts with some bare facts about what has recently happened but provides no real details and the book becomes a slow and non-linear patchwork that fills out how Jason and Catherine met, their relationship, their art and finally what happened on the day Jason wins the Turner Prize and Catherine exposes her infidelity in her suicide video. Along the way, Jason strips back the layers to reveal who Catherine really was in a series of discoveries that are somewhat baffling when played back in line with Jason’s recollections of their relationship. The interwoven back-story and ongoing mystery is quite fascinating even though fairly slow moving. The author uses the timeline of this story like his own work of art mixing and matching present and past along with fragments of key scenes punctuating the larger passages. I was impressed by the structure of the story, though I needed to be fully focused to stay on track. As the novel progresses, the story transitions from a personal mystery into a suspense/drama and at this time the author seems to shatter the remaining timeline into smaller pieces presenting the reader with several smaller non-linear story fragments. I don’t think it created the suspense that I believed it was supposed to. The increased concentration required to reassemble the story while reading detracted from the impact of the first major revelation. However, the reveal was big enough that it still punched through any lingering confusions. I’m not sure if it was unfortunate, but quite a bit of this shocker I had worked out towards the start of the story. At this point the reader has entered the end-game of the book which plays out rather rapidly with a few more revelations and some action scenes to make sure the adrenalin is pumping. As far as characters go, there are some interesting ones in Work of Art. Given that the main characters are artists, we see them somewhat through their art. 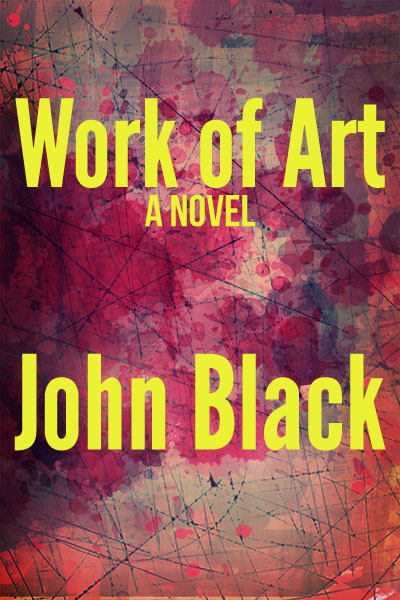 I have to say that John Black certainly has a way of portraying artists and art itself. Either he’s describing existing works or he has a fantastic imagination – regardless, I was impressed. It won’t be surprising in a story about artists that depression, suicide, and a somewhat negative view of the world tend to prevail, but this was neither disappointing nor disheartening for me. Neither was the fact that I don’t think I could really relate to any of the characters. For this book, I didn’t have to relate, just observe and react. There was a downside to this novel, though it wasn’t the characters or the dark subject matter. This novel seemed to lack any kind of quality proof-reading. It was crushingly disappointing given how well I believe the novel was constructed in other aspects. Constant issues with typos, tense problems and word misuse would have had me dumping the book before the halfway point had I not been so sympathetic to the novel in other ways. If only the author could submit this to an editor or at least a very good proof-reader, I believe the book could be in the same shelf as Barbara Vine, one of my favourite mystery writers. I read a review recently that compared this novel favourably with Iain Banks of The Wasp Factory fame. Again, I feel that the comparison should be warranted. But as it is, the book shouldn’t be on a shelf at all until it’s raised to publication standard. And so I struggle to find the right balance with my final assessment of Work of Art. I can’t give the book a recommended status (3.5 stars and higher) because of the lack of quality in copy-editing. However, I do need to recognise what I believe to be a cleverly constructed and artistic mystery which is authentic in subject matter, depressingly dark (often a plus depending on the reader) with a reasonably exciting kicker towards the end. So I think it has to be 3 stars from me. This entry was posted in 3, Mystery, Novel, Reviews. Bookmark the permalink. Thanks Simon. It’s difficult being harsh to a book that you really like. I feel I have an obligation to readers to point out the copy-editing issues, but at the same time I’m really interested to read what this author puts out next. It’s frustrating that this was one or two solid proof-reads away from a “highly recommended” rating.